An online trader who made thousands from peddling banned cosmetics and cures, which she falsely claimed could cure serious illnesses, has been ordered to pay back £31,000 of her ill-gotten gains. At a Proceeds of Crime Act hearing at Gloucester Crown Court on Thursday (November 1) Merarie Day, 49, of Milizac Close, Yealmpton, was ordered to pay back £31,199.91. The court heard that Day had benefitted by over £400,000 from her criminal activities, with most of the money being sent back to the Philippines. Thanks to its financial investigation, Devon, Somerset and Torbay Trading Standards Service was able to identify some of the money still available. If May fails to pay back £31,199.91 by February 2019 she will be sent to prison for 18 months. Day will remain liable for the remainder. Day had been given a nine-month suspended prison sentence last February for selling banned and dangerous cosmetics including skin lighteners. Day used her own website and an eBay account to advertise her merchandise, which she imported from the Philippines without carrying out any checks or keeping any records. 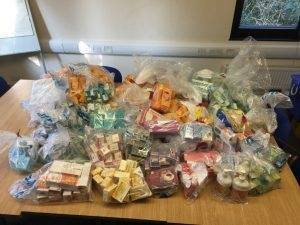 Despite receiving repeated advice from Trading Standards, Day continued to import the goods, including cosmetics containing hydroquinone, and selling them. Trading Standards officers had seized over 600 items including JJJ Golden Spot Removing Cream. The cream contained mercury which can accumulate in the body and cause liver, kidney and brain damage. Stephen Gardiner, Devon, Somerset and Torbay Trading Standards Interventions Manager said: “By selling these products she put personal profit over the health and wellbeing of her customers.